I love Minute to Win It Games - I thought up a couple to play with my kids for Easter and then Earth Day - and we had so much fun. 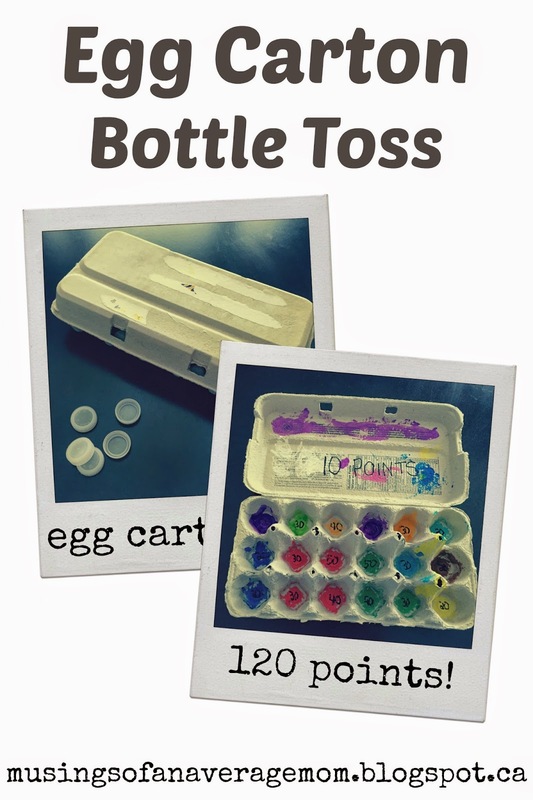 And for this game: Egg Carton Bottle Toss is was just as much fun making the game as it was playing it. All you will need is an empty egg carton and some water bottle caps. If you don't have water bottle caps then you can use little pom poms or anything else that is small. We used an 18 egg carton because we go through a lot off eggs in our house but 12 would work just as fine. And once the paint is dry use a magic marker to mark points in the bottom of each hole. I did 50 for the two middle ones, then, 40s, 30s and 20s. 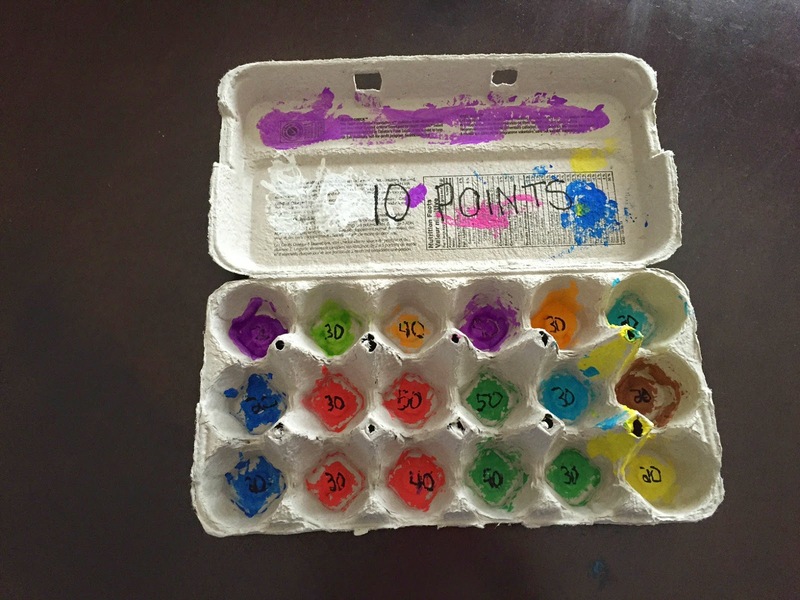 I left the lid on and marked it as 10 points because my kids are quite little and had a little trouble hitting the egg carton sometimes but, you can remove the lid for older kids. And once you are done set the egg carton on the floor and mark out a starting point with tape. You can have more than one line for different ages. And then see how many points you can get in a minute. If you run out of bottle caps you can run around and collect the ones you missed. A variation of this game is to give everyone a set number of bottle caps - like 10 and have each player take a turn and write down their score for that round on a scrap piece of paper. I actually had a ton of fun with this game too! I actually hit the 50 points a few times and was pretty proud. Let me know how yours turn out! Or leave a link in the comments to the one's you make. And happy Earth Day! What a fun idea! We almost have an empty carton. My three year old has totally been into painting lately, so I will make her day letting her get creative with the carton. We don't drink bottled water often, so I think we'll use pennies. Thanks for sharing! We did a very similar game a while ago, my children loved it. I need an 18 count egg carton. I know this is for the kiddos but I could totally see my hubby and I doing this too! I'm featuring this post at the new Summer Family Fun party starting tonight! We can never have too many game ideas to entertain the kiddos. Thanks so much for sharing. This seems like an awesome idea! Thanks for sharing with #Alittlebitofeverything!